This Sunday October 21, 2018 there will be (1) Smart Source and (2) Red Plum Inserts! This Sunday October 14, 2018 there will be (1) Smart Source and (1) Red Plum Inserts! This Sunday October 7, 2018 there will be (1) Smart Source and (1) Red Plum Inserts! This Sunday September 30, 2018 there will be (2) Smart Source, (1) Red Plum and (1) P&G Inserts! This Sunday September 23, 2018 there will be (1) Smart Source and (1) Red Plum Inserts! This Sunday September 16, 2018 there will be (1) Smart Source and (1) Red Plum Inserts! This Sunday September 9, 2018 there will be (2) Smart Source and (2) Red Plum Inserts! This Sunday August 26, 2018 there will be (1) Smart Source, (1) Red Plum and (1) P&G Inserts! This Sunday August 19, 2018 there will be (1) Smart Source and (1) Red Plum Inserts! 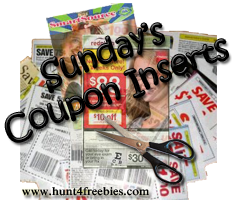 This Sunday August 12, 2018 there will be (1) Smart Source Insert!